Presbyterians trace their history to the 16th century and the Protestant Reformation. Our heritage, and much of what we believe, began with the French lawyer John Calvin (1509-1564), whose writings crystallized much of the Reformed thinking that came before him. Calvin did much of his writing from Geneva, Switzerland. From there, the Reformed movement spread to other parts of Europe and the British Isles. Many of the early Presbyterians in America came from England, Scotland and Ireland. The first American Presbytery was organized at Philadelphia in 1706. The first General Assembly was held in the same city in 1789. The first Assembly was convened by the Rev. John Witherspoon, the only minister to sign the Declaration of Independence. What is distinctive about Presbyterian Church? Presbyterians are distinctive in two major ways: they adhere to a pattern of religious thought known as Reformed theology and a form of government that stresses the active, representational leadership of both ministers and church members. A little Presbyterian history: Portions of the Presbyterian church in the United States have separated from the main body, and some parts have reunited, several times. The greatest division occurred in 1861 during the American Civil War. The two branches created by that division were reunited in 1983 to form the Presbyterian Church (U.S.A.), currently the largest Presbyterian group in this country. Presbyterian theological beliefs: Some of the principles articulated by John Calvin remain at the core of Presbyterian beliefs. Among these are the sovereignty of God, the authority of the scripture, justification by grace through faith and the priesthood of all believers. What they mean is that God is the supreme authority throughout the universe. Our knowledge of God and God's purpose for humanity comes from the Bible, particularly what is revealed in the New Testament through the life of Jesus Christ. Our salvation (justification) through Jesus is God's generous gift to us and not the result of our own accomplishments. It is everyone's job - ministers and lay people alike - to share this Good News with the whole world. That is also why the Presbyterian church is governed at all levels by a combination of clergy and laity, men and women alike. Our position on social issues. 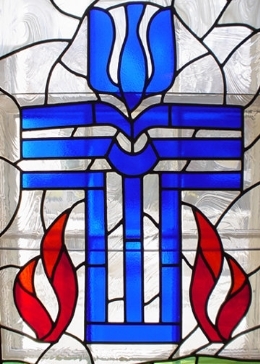 In the 1958 Statement of the PCUSA, p. 537: The General Assembly: Affirms its conviction that neither the Church as the body of Christ, nor Christians as individuals, can be neutral or indifferent toward evil in the world; Affirms its responsibility to speak on social and moral issues for the encouragement and instruction of the Church and its members, seeking earnestly both to know the mind of Christ and to speak always in humility and love; Reminds the churches that their duty is not only to encourage and train their members in daily obedience to God's will, but corporately to reveal God's grace in places of suffering and need, to resist the forces that tyrannize, and to support the forces that restore the dignity of all men as the children of God, for only so is the gospel most fully proclaimed. 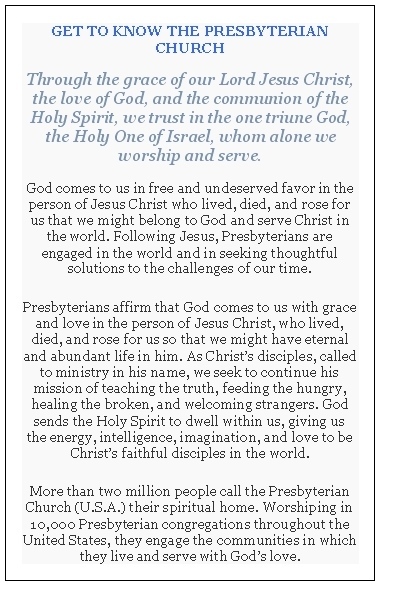 Who are we Presbyterians? As far back as 1837 the General Assembly declared that the church, by its very nature, is a missionary society whose purpose is to share the love of God in Jesus Christ in word and deed and with all the world. Witnessing to the good news of Jesus Christ throughout the world, Presbyterians engage in mission activities, seek to alleviate hunger, foster self-development, respond to disasters, support mission works, preach the gospel, heal the sick and educate new generations for the future. In partnership with more than 150 churches and Christian organizations around the world, the missionary efforts of the Presbyterian Church (U.S.A.) involve approximately 1,000 volunteers and compensated personnel.